Here is my PPBF selection for today. 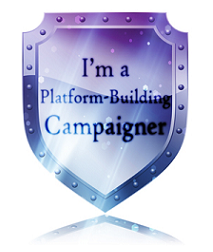 Last week and last Tuesday I blogged on my new writer’s platform for Rachael Harries Writer’s Fourth Platform Campaign, Yet my comments showed all my friends from PPBF read and stopped by. I was so impressed by all of you. You are sticking by me even though I have strayed from the norm to strengthen my platform with new readers. I am so amazed and delighted that I didn’t loose all of you as readers in the process. What a wonderful group you are. All of you are so special. I’ve made a special breakfast of pancakes and maple syrup to go with your hot chocolate this morning. I’m not sure what the official breakfast food is now but eat up while it’s hot. Now you’re ready to read this. In http://www.kupferbergcenter.org/revelations/teacher_guides/strega_nona_tg.pdf there are activities for the K thru 1 and for the grades 1 thru 3 keeping them busy for days. 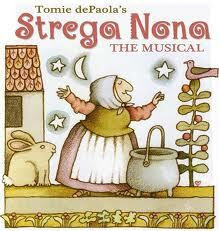 I learned that the name Strega Nona was a concert which was performed by a children’s musical theatre. “This lively musical, Strega Nona, was originally developed as a touring production for the renowned Children’s Theatre Company in Minneapolis by Thomas Olson and Roberta Carlson, with music by Aron Accurso, award-winning member of the famed BMI Lenhman Engel Musical Theatre Workshop.” And that Tomie dePaola wrote lot of other Strega Nona books. I have read other Tomie dePaola books and put them on PPBF not knowing all this. It’s amazing what a little digging will bring. Lol. On http://www.scfta.org/home/Media/education_bus_ins/Strega_Nona_Teacher_Guide.pdf there are pre and post concert lessons ranging from Math, Music, Visual Arts and Science giving a table of contents on how best to use the teacher guide. There is a sheet about how Strega Nona came about and a map of Italy. There is even an Italian flag with fun facts of Italy. I almost got lost in these guides looking and browsing for hours. There was no stopping the fun! Would you like to cook some Pasta? It’s on those sheets. They are a teachers saviour for a day when she needs lesson plans about an author or book. I hope the testing hasn’t done away with all the author and book lessons. Does anyone know?? Strega Nona’s Magic Lesson, Sandpiper, 1984. Strega Nona Meets Her Match. Putnam, 1996. Strega Nona, Her Story. Putnam, 2000. Brava, Strega Nona. Putnam, 2008. Strega Nona Takes a Vacation. Putnam 2003. Big Anthony and the Magic Ring. Sandpiper, 1979. Big Anthony, His Story. Putnam, 2001. Merry Christmas, Strega Nona. Sandpiper, 1991. Big Anthony overhears and wants to learn too, but Strega Nona refuses. Taking over Bambolona’s job at the bakery, Big Anthony creates havoc and gets fired the very first day. He then crashes Strega Nona’s magic lessons wearing a clever disguise with even more disastrous results. Once again Tomie dePaola has given us a story lavishly illustrated in full color that is filled with humor and presented with consummate skill. First two sentences: Bambolona, the baker’s daughter, was angry. Every day, summer, fall, winter, and spring, she had to get up before the sun to bake the bread. Why I love it: Several times the funny bone was hit and I had to laugh out loud. This hilariously funny tale about how Big Anthony tries to help at the bakers and then learn magic in his buffoonery way is just too funny for words. But Tomie writes them and then illustrates them. I think the Italian words sprinkled throughout the story make it richer. Just think of the name Strega Nona meaning Grandma Witch. To his readers of little kids this surely makes for more mystery. The story is pure genius teaching that deception is not an answer to a problem while putting entertainment at center stage. 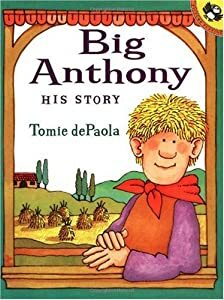 This entry was posted in blogging, Clara Bowman-Jahn, Clarike Bowman-Jahn, Course or Book Review, social networking and tagged Big Anthony: His Story, Perfect Picture Book Friday, Picture book, Strega Nona, Susanna Leonard Hill, Tomie dePaola. Bookmark the permalink. I’ve never heard of this before, it sounds so unique. I can’t wait to read some. Will read your entry later for sure Clara. So glad you like pancakes. Make that chocolate syrup if you like. What a fun story, character and illustrations! Thanks for the introduction. I’m enjoying your platform posts. I knew I wouldn’t have time to participate this time. I think it’s a great network. I so love Tomie de Paola’s books. He is one of my favorite author/illustrators. We have many Italians in school, so it was always fun to have their versions of some of the folk characters Tomie uses in his books, like Strega Nona. Those resources do look great and aren’t those bold illustrations fabulous? I love Tomie dePaola and all of his books. He visited Dayton a lot in the early to mid-90s and my daughter has many autographed books. He was always such fun. I love Strega Nona, but this particular book I’m not familiar with. My daughter was graduating from high school in 2003, so I’ve missed out on his more recent books. Will need to just sit down in the library and read through some of them. Thanks for sharing. By the way Clar, as long as you contribute a PPB we see your smiling face and know you’re still with us. You have a lot going on with your book release. Thanks, Patricia. I have a CD of Tomie’s That tells his method of writing picture books which I have been wanting to blog about. I’m going to do it soon. I just love his way with words and how they compliment his stories. Strega Nona! I just got that out of the library last week to read to my kids because we were having a fun spaghetti dinner and I was remembering the magic noodle pot. I love Tomie DePoala’s illustrations, too. So fun! Tomie dePaola is a master writer – no doubt about it. I just love the Strega Nona stories. They ARE magical in more ways than one. Thanks for bring them to us on your Friday blog. I agree with the magical quality. In more ways than one. lol. Oooh, hubby’s off to Italy in a couple of months. I always like teaching the kids about the places he travels. I’ll have to pick up Strega Nona so we can talk about Italian culture. 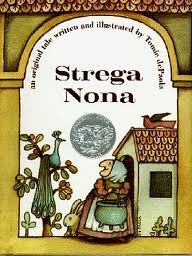 I really like the Strega Nona books! I am glad you added some to PPBF! The stories are always good and I like the illustrations! http://darlenefoster.wordpress.com/2012/03/01/you-are-my-sunshine/ Hope you like it! There is something so charming about the Strega Nona books! Being Italian, I grew up reading these with my own Nona, so they bring about warm memories. We say Oma in Dutch for grandmother, since we are from Holland. But I have only a very vague memory of her as I left when I was seven and I’m not even sure she knew how to read. I only remember my own mother reading the Bible to me, no picture books. 🙂 Yeah , I’m deprived. boo hoo. I love Strega Nona! She is such a fun character to read aloud 🙂 I’m so glad you added her to the list. I love, love, love this book! Tomie de Paola is one of my favorite author/illustrators. I love how his books are simple yet full of depth. Even his art style to me is simple, which I really gravitate to. Thanks for adding it to the list! Thanks for adding this to the list. I have been wanting to read it, and your review makes me want to read it ASAP! I just loved your pancakes Clar and dripping in maple syrup….. wonderbarrrrr…. I love Tomie dePaola, his zest for life and his humour shines in his books. I came across an autobiographical christmas book he wrote for all children, big and small, and posted it on my blog in July last year. Here is a link to it… http://thepatientdreamer.com/2011/07/12/book-reading-challenge-book-no-30/ . Your post was very touching, Diane. Thanks for sharing it with me. I just love Tomie dePaola and someday hope to do a post that will highlight him as well as you did. I found you through Vivian’s award post. 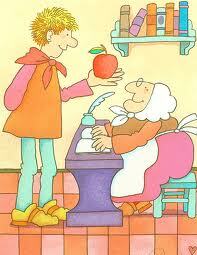 I love Strega Nona and Big Anthony….and Tomie dePaola is just the best! I adore children’s books. I taught kdg. for nearly 30 years and collected about 400! Now I’m retired with 400 children’s books I love! 😉 Tomie is one of my favorites! 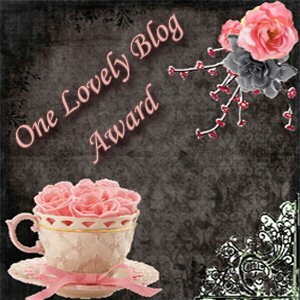 I really want to follow your blog! Give me two seconds and I will! Glad to meet you! Oh! Thanks for following and for the kind words about Tomie dePaola. He’s one of my favorites too. I also featured him on another PPBF with his book “Trouble in Barker’s Class”. Nice to meet you, too. 🙂 So glad you found me.